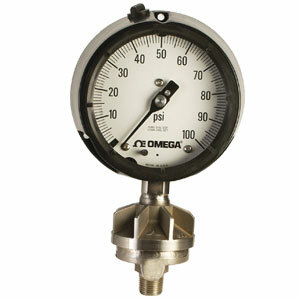 OMEGA’s PGR Series All-welded gauge and seal offers customers a lower cost alternative to an individual gauge and diaphragm seal with the added advantage of a reduction in potential leaks. The wetted parts are 316L stainless steel. The process connection is a ½ NPT male bottom mount.